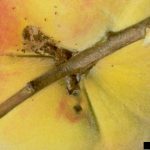 What is an effective borer control for peach trees in my area (northern Utah)? I have tried numerous systemics, sprays and natural means (pheramone traps and spinosad). Nothing works like lindane did and now I cannot find lindane anymore. What do you suggest?